After its beginnings in the 8th century based on Hellenistic geography, Islamic geography was patronized by the Abbasid caliphs of Baghdad. Various Islamic scholars contributed to its development, and the most notable include Al-Khwarizmi, Abu Zayd al-Balkhi (founder of the Balkhi school), and Abu Rayhan Biruni. 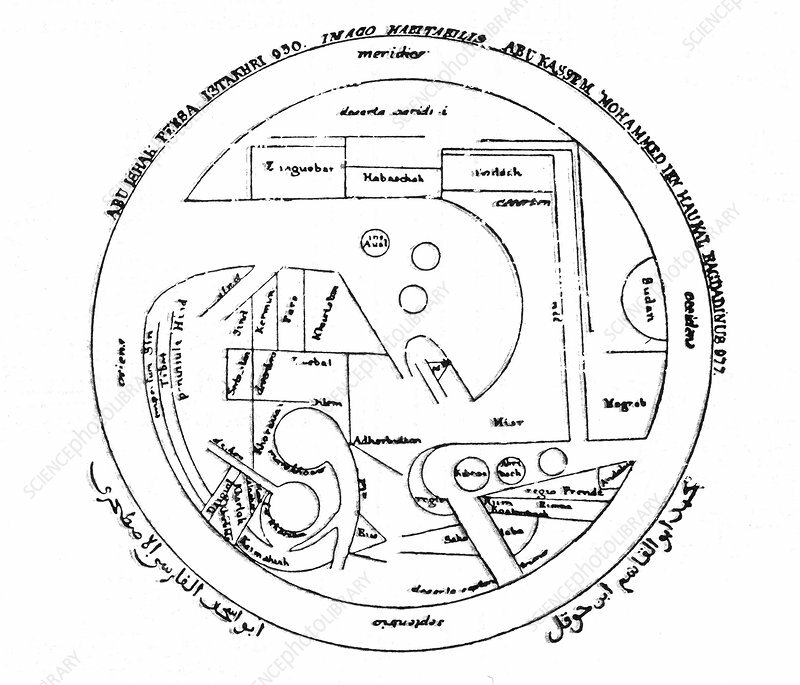 Islamic cartographers inherited Ptolemy's Almagest and Geography in the 9th century. These works stimulated an interest in geography but were not slavishly followed. Instead, Arabian and Persian cartography followed Al-Khwarizmi in adopting a rectangular projection, shifting Ptolemy's Prime Meridian several degrees eastward, and modifying many of Ptolemy's geographical coordinates. Having received Greek writings directly and without Latin intermediation, Arabian and Persian geographers made no use of European-style T-O maps. No artist credited, undated.